For some reason, the thought of computers and technology sprang to mind this evening and seemed to be a good topic to write about because of how they have invaded many of our lives. Consider that I am typing this essay on a word processing program that I will cut and paste into a WordPress screen, insert an image or two and press a button that will open it up to the availability of most of the planet to view and comment on, using technology that was not available just a few years ago. Someone might read it on a BlackBerry, iPhone or Droid handheld telephone that also has technology that wasn’t available until recent years or they may send it as a file in an e-mail that can go to any person that has an email address. This is technology we have now and mostly take for granted even though our parents could not have imagined the capabilities we have today any more than I could have believed such things would be so readily available to the new generation coming up now. This past weekend, my wife and I purchased a kid-friendly laptop for our six year old son for Christmas and the whole time we were doing this, I was having a hard time wrapping my brain around buying a computer-not a toy one-but a real, fully capable laptop computer-for a child his age. When I was six, computers were something that was on Star Trek for the most part. The few real ones that did exist were giant, room-sized devices that cost millions of dollars and required people specially trained in programming and writing code just to operate them. Today, my telephone has more computing power than the on-board computers that went with and assisted Apollo in the moon landings of the late 60’s and early 70’s. He is getting a computer for his sixth Christmas; I got a G.I. Joe with accessories. Still, I consider myself to be very fortunate that I am proficient with computers because had circumstances been just a bit different, I might not be as adept at using them. My mother, who is 19 years older and one generation above me, had no computer technology available to her when she was in High School. As one of the early Baby Boomer generation, her class came through at a time when primitive computer technology was usually available only to engineers who specialized in fields that were implementing computers, such as the aerospace industry. I was fortunate, because my last year of High School, I had a lot of free class time on my hands and our school got computers to teach students about computing for the first time. What if my parents had not decided I was too young to go to first grade and had not made me go to kindergarten a second year? I could have missed out getting my hands on one for the first time, gone on to college or a job without any skills in computers at all. Or what if they had not insisted that I take typing class my sophomore year? Another, vital skill would have been missed that would tie directly into computing. When I began to take typing, we had manual typewriters. It was all the private school that I attended could afford then but fortunately I knew a little about how they worked, having abused my grandfather’s poor Underwood typewriter from the 1940’s most of my life. We learned the touch type system, meaning the layout of keys assigned in a certain pattern of letters based on where your fingers would be used the best. Today we call that a QWERTY keyboard on computers, smart phones and so forth. We were expected to memorize where the keys were and be able to punch them without looking at them and our teacher would often makes us tape a piece of notebook paper to the frame so that our hands rested under the paper and we couldn’t see the keys. They also made plastic covers to go over the keys as well. I learned this quickly and became pretty fast (for a male, I was told at the time). The next year I transferred to the public school system and found out that government funding ensured better equipment and at my parents insistence, I continued to take typing for another school year, mastering the new, modern, IBM Selectric typewriter, powered by electricity. It was fun to type on one of those and observe the movement of the rotating striker ball as it advanced and spun, striking the page faster than your eye could follow and sounding like a machine gun when you held down the spacebar. Of course, we all used to get high sniffing correction fluid, the white paint you used to correct a typing error and we could type “The quick brown fox jumped over the lazy dog” in our sleep. At my peak, I could type 95-100 words per minute with good accuracy but I can’t do that anymore except in short bursts occasionally. Today I do well at about 80. I remember hearing the rumor that we had actually gotten computers installed over the summer break but I had to go and see it for myself. Sure enough, there they were, sitting in a newly closed off, secure section of the Business Ed department. 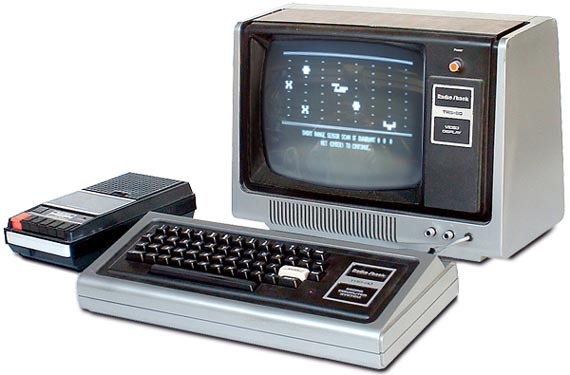 The Radio Shack TRS-80 Model 1 computers were bulky, urban-gray plastic components with a thick keyboard connected by wires to a big, boxy black and white monitor. An accompanying printer would print code on silver colored thermal paper and a tape cassette recorder was also attached. I think we had a grand total of three of these modern, state of the art computers in an oversized classroom space full of typewriters and adding machines. Mrs. Brooks graciously agreed to allow me to look (but not touch) the doorway to the future. There weren’t a lot of slots available but I was in good with the school counselor and managed to get one and soon I was computing, learning to write codes in a computer language called BASIC that, after many lines were input, would make the computer perform simple arithmetic much like a basic calculator. A few pre-written programs could be loaded into the computer by means of a tape cassette, such as the one that would play Tic-Tac-Toe with the user and with a massive 32 kilobytes of RAM memory on board, the sky was the limit. That’s right….32 KB. To put that in perspective, this very article takes up a total of 19.1 kilobytes of memory in my laptop. That same amount of memory was more than HALF of the computing memory of an entire computer in the early 80’s. By the time I was nearing graduation, we received some even newer computers, the Model 3 with the unibody look (the keyboard and the monitor were combined into one shell) and this one had a floppy disk drive for storing data on a floppy disk (floppy meant just that; the 5.25 disks were very bendable and prone to easy damage) and this computer doubled the RAM to 64 kilobytes of space. We really thought the unibody look was the future of computers but in this case, the design later went retro back to a detached keyboard. In college, I took a few courses on some very nice Wang computers and learned more about programming but just enough to realize that I was destined to be an end user, not a programmer. The thought of engaging in a career writing lines of code was enough to make me want to pull my teeth out. Amazingly, I avoided computers for several years as I worked in public safety but when my employer got their first Personal Computer (PC) on a grant, nobody knew how to use it so I got to put my skills to work and figure out how it worked. It was shocking-and a bit daunting-when I realized how much computers had progressed in just a span of five years. IBM compatible was now the standard and this computer just happened to be an IBM itself with a 386 processor. Storage was now in terms of Megabytes and on a built-in hard drive at that. This computer ran on a program called MS-DOS and once you figured out how that worked, you could get around pretty good in the file system. It has a simple word processing program coupled with a database and spreadsheet program, all grouped in a program called LotusWorks. A freebie thrown in was Quicken 3.1 that would help you keep your checkbook balanced. That was about all it had but now the computer was truly a tool and I found myself using the office typewriter less and less as I learned to do tasks on the computer. LotusWorks was such a good program that I kept it for many years as successive computers came along. In 1994, I bought my very first computer for the home-an IBM compatible no-name brand that I borrowed $1000.00 from my Dad to buy-and that was a LOT of money to me-almost 3 car payments! I had gone back to college that year and found work to be a lot easier when you had a computer to write papers on, check you spelling and print it on the trusty dot matrix printer that you had to tear the strips with holes off the sides of the paper after printing. From that point on, computers were a daily part of my life, traded up for newer ones as time went on. In 1996, I was given a slightly used laptop computer (another evolution in computer design) that had a modem and one day I got one of those great free diskettes in the mail from AOL and decided to try out the internet for the first time ever. Slow dial up, constant busy signals and bad connections were endured daily but when I did get “online”, I was able to surf the World Wide Web using search engines that existed way before Google was ever thought of. There wasn’t nearly as much out there back then but there was enough to keep one interested and e-mail became part of our language. Handheld computers like the Palm Pilot were the next step for me, simple handheld computers that allowed you to write in digital ink to input dates, addresses and memos into the unit and back them up to your computer. A few years later, they converged with cell phones into handheld communications devices that send e-mail, take calls, schedule appointments and a range of other things. The modern smartphone was born. I stand in awe of how fast computer technology has advanced since I first set eyes on a personal computer and it boggles the mind that in less than three decades, we have gone from a time when three computers existed in my hometown with a cumulative memory of 96 kilobytes to a day when nearly every home, business and classroom has one if not multiple computers. The evolutionary change between those first three and the one I am typing this on tonight is as vast as going from the stone wheel developed by primitive man to the Space Shuttle of the present day. We can type a document in our living room and collaborate on it with other people in China simultaneously. We can record images and video in digital format and upload it for the entire world to see. We can use virtual world technology to create online collaborative communities that bring people together from around the world to work towards common goals. We can compile the collective knowledge of mankind in a medium that nearly every human being has access to and advance the sum of our knowledge exponentially every few years instead of every few centuries…..and so much more. Remember when it was a BIG DEAL to get a long distance telephone call? (From 50 miles away) When somebody told you that you had a long distance telephone call, you dropped everything to get the phone…now we Skype with people around the world and think nothing of doing it. How did we ever reconnect and get back in touch with old friends before Facebook? How much wasted space did we have on shelves storing record albums, cassettes and CD’s before the iPod? How did we ever find something before Google? Or publish our own words before WordPress? A “Tweet” was something a bird did and Blackberry was a piece of fruit. Windows were things you looked through and a mouse was something you tried to kill if it got into your house. Computers have changed our lives, how we work, how we learn, how we look at things, how we interact and socialize with each other, how we design things and how we run the world today. Who knows what advances will come over the next thirty years because of them or what computers will be in 2040. I just hope I’m around then to see what MY grandchildren get for Christmas when they are six years old!